Two rituals will take place in Athens this weekend. 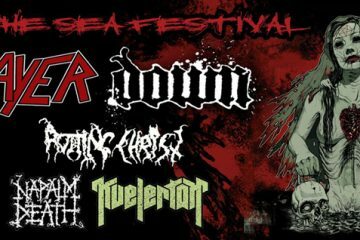 We are talking for the mighty ROTTING CHRIST of course, who, after the already sold out show on Saturday 25th of March, announced a second gig for Sunday 26th. That means a great chance for Metalpaths to do a little retrospective on the bands’ career. Join us, as we go back in time, to the humble beginnings of one of the greatest Greek metal bands ever. The year is 1988. Two brothers at the age of 14 (Themis Tolis – drums) and 16 (Sakis Tolis – guitar/vocals) began their musical journey, trying to emulate their idols at the time (Hellhammer/Celtic Frost, Bathory, Possessed, Venom). 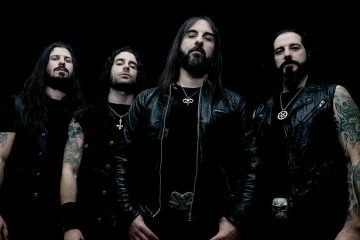 Choosing the name Rotting Christ, a venomous attack against Christianity, was a conscious choice, showing the bands’ stance towards religion. The line-up was complete with the addition of Jim Mutilator on bass. Oddly enough, though, their first recordings ever had more to do with grindcore. Those recordings consisted of two uber-raw rehearsal demos “Leprosy Of Death” and “Decline’s Return”. Lack of technique, undying passion for heavy, relentless and uncompromising music, lyrics and song titles taken straight off Carcass’s early works were the main elements of those two demos. Since that was just rehearsal recordings, their grindcore era ends with them recording at an actual studio, a split LP with Sound Pollution on TNT records. The joy of seeing their first work ever on an LP, made them take things more seriously in the years to come. Drastic changes for Rotting Christ on their first independent demo release, with the change of the early logo to the famous one they use today, but most of all the beginning to turn into the black metal masters they would later become. One of the most celebrated demos of the extreme metal underground, showcasing the bands’ brand of black metal and the primitive Mediterranean darkness coming through their songs like “Feast On The Grand Whore”, “The Nereid Of Esgalduin” and “The Hills Of The Crucifixion”, that are still being played on occasion to this day. And alongside the split with the Italian Monumentum, Rotting Christ enters their golden era. First EP, and another major change to the table: Magus Wampyr Daoloth (Necromantia mastermind) on keyboards. Starts giving the band that atmospheric, gloomy Hellenic black metal sound that we’ve learned to love and set the Hellenic black metal scene apart from their Norwegian or Swedish counterparts. “Old Coffin Spirit” “The Forest Of N’Gai” and especially “The Mystical Meeting” carry on where the band had left off with “Satanas Tedeum” 2 years, but the keyboards add that special touch, whereas in “Gloria Dei Domino Inferni” they truly shine on their own. Then come the “Ade’s Winds” demo (1992), the “Dawn Of The Iconoclast” 7″(1992) and their first ever release on the French Osmose Productions called “Αποκαθήλωσις” (1993), showing what would come in the same year in full-length form. The classic Rotting Christ sound fully takes form on this album. The Hellenic black metal sound in all of its glory and magnificence. The keyboards have matured as an integral part of the sound of Rotting Christ, giving the album the proper atmospheric gloomy feel, while keeping the old school feeling intact. While “The Sign Of Evil Existence” starts off the album with an old school punishing blast, songs like “Exiled Archangels” “Fgmeth, Thy Gift”, “Transform All Suffering Into Plagues” and “The Fourth Knight Of Revelation” show the band can slow down creating tension and release with those heavy yet beautifully doom sounding riffs, giving a sort of epic feel to some of the longer songs. True black metal classic, hailed even by those who don’t like the bands’ recent endeavors. A drum machine was used on this album and the next, despite the fact that Themis was still a member of the band. Going on the same route musically, changing record label (Unisound records) and going on lengthier and more adventurous songs (“Wolfera The Chacal”, “Where Mortals Have No Pride”, “Saturn Unlock Avey’s Son”), gloomy melancholic tracks (“Morality Of A Dark Age”) undying concert classics and statements of the band (“The Fifth Illusion”, “Non Serviam”), Rotting Christ show that are clearly here to stay and take on the world with their crushing brand of black metal, under the same motto “Non Serviam” (“I will not serve”). Another record label change (Century Media), Magus leaves the band due to musical differences, and an even more melancholic and epic approach is added to their trademark black metal sound. Recorded while Themis and Sakis were suffering measles, it has turned them to highly memorable songs, without them being commercial sounding or anything like that. Their first production abroad at Andy Classen’s studio in Germany, resulted in the most mature Rotting Christ of the first era. It’s like their own “Black Album” so to speak. Epic-sounding and lengthy tracks (“King Of A Stellar War”, “A Dynasty From The Ice”, “The First Field Of The Battle”) in the same record as melancholic elegies (“Snowing Still”, “The Opposite Bank”, “Shadows Follow”) along with mid-to-fast-paced crushers (“Archon”, “One With The Forest”, “Diastric Alchemy”). Pure perfection, the writer’s favorite, and the perfect end to the first era of Rotting Christ. Also this should be Jim Mutilators’ final recording with the band as a bass player. 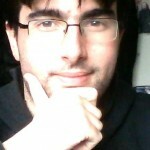 Gothic metal comes into play 2 years after “Triarchy Of The Lost Lovers”, along with the addition of Costas Vassilakopoulos on lead guitars and Andreas Lagios on bass. The winds of change and experimentation washed over Rotting Christ, but not their classic character and their trademark melodies. Since they could never top its predeccessor, “A Dead Poem” followed a vastly different and more catchy so to speak approach made evident on songs like “Sorrowful Farewell”, “Ira Incensus”, “Out Of Spirits”, “As If By Magic” and of course “Among Two Storms” including frontman of label-mates Moonspell, Fernando Ribeiro. It was the beginning of a long friendship between the two bands, who even toured together that same year. Keyboards were played by Xy of the Swiss Samael. As a natural continuation of the previous record, we can call this one, the most romantic Rotting Christ album of all time. Its whole approach and atmosphere, is simply mesmerizing and a warm welcome for any hopeless romantic soul. While elements of the black metal self of Rotting Christ still exist they are simply reduced to some fast breaks like the chorus of “The World Made End” but it’s mostly in the style of “You My Flesh”, “Thine Is The Kingdom”, “Cold Colors” and of course the band’s first video clip “After Dark I Feel”, carrying a gloomy darkened beauty that had always been a part of Rotting Christ’s identity regardless of era. A sound change that was about to end on this album. The band starts shifting back to their original black metal sound, but with a twist: industrial feel all over the place. And the first record to not feature Themis as a member but Jan Roger Halvorsen (drums). Did that stop them from killing it musically? Of course it didn’t! Songs like “Thou Art Blind”, “If It Ends Tomorrow”, “My Sacred Path” and “Art Of Sin” show the renewed Rotting Christ of the 21st century as well as their industrial side (“You Are I”, “Fateless”, “Glory Of Sadness”, “Time Stands Still”). Also, one of the most successful Rotting Christ covers was the one on Current 93’s “Lucifer Over London”. With the new millenium, it was time to go back to the roots of the band and make the strongest comeback possible. “Genesis” is just that, classic Rotting Christ with the sound and approach of 2002. Crushers like “Quintessence”, “Lex Talionis”, “In Domine Sathana” and “Dying” show how much the band has matured and how it can still create amazing music after all those style changes. The beautifully atmospheric “Under The Name Of A Legion” ends the album in the best way possible, taking us back to their early days, when they created long epics like this one. Accompanied by their first DVD “In Domine Sathana” filmed live in Krakow, Poland. The breath of the new era, blows cold through the intro riff of “Visions Of A Blind Order”, including guest solo by Firewind’s virtuoso Gus G.. 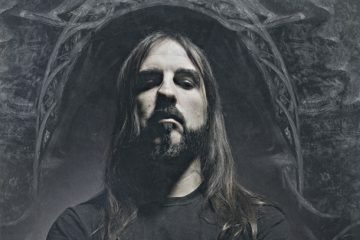 Songs like “Thy Wings Thy Horns Thy Sin”, “Tyrannical”, “Sanctus Diavolos” truly stand out with their bleakness but the key factor to this album’s success is the first almost-fully Greek song of Rotting Christ “Athanatoi Este” (“you are immortals”): a call to arms to the ones that love Rotting Christ and believe in their dreams and dare to make them come true. Like Rotting Christ did. “ΉΤΟΙ ΜΕΝ, ΠΡΩΤΙΣΤΑ, ΧΑΟΣ, ΓΕΝΕΤΟ”. I could’ve just stopped the review right there, but there’s more to this modern-age classic other than “Χάος Γένετο (The Sign Of Prime Creation)”. First of all, it’s the debut of George Bokos as lead guitarist replacing Costas Vassilakopoulos. It’s the thunderous whiplash of “Keravnos Kivernitos”, “He, The Aethyr”, “Helios Hyperion”, “Enuma Elish” and “Rege Diabolicus”, the Celtic-Frost-worship of “Phobos Synagogue”, the ritualistic “Threnody”, the mid-tempo melodic “Gaia Tellus”and the zampuna-flavored “Nemecic” which has become a modern classic among Rotting Christ fans, bringing a new generation of fans to the scene. Something made evident on the December gigs of 2007, recorded for the “Non Serviam – A 20 Year Apocryphal Story” DVD. On this record, Rotting Christ look through the eyes of a warrior at the time of his last fight. “Aealo” and “Eon Aenaos” sound the charge into battle, “Δαιμόνων Βρώσις” and “Noctis Era” are trademark mid-tempo Rotting Christ crushers, Alan Nemtheaga (Primordial) elevates the “Thou Art Lord” crusher, Diamanda Gallas sends chills down our spines with the closing cover of “Orders From The Dead”, Androniki Skoula (Chaostar) creates an eerie atmosphere on the punishing “Santa Muerte” and the traditional choir Pleiades from Ipeiros, Greece complete this tribute of the band to the Greek tradition drenched in war and blood. Another line up change: George Emmanuel (guitars), Vaggelis Karzis (bass) and Rotting Christ start to explore lots of different cultures. From Romanian curses (“Cine iubeşte şi lasă”), to the opus of Gilgames (“Gilgames”), the Mayas (“In-Yumen Xibalba”), Greeks (“Kata Ton Daimona Eautou” and the biblical “ΧΞΣ”) and everything in between, including bagpipes by George Nikas, it clearly expands the “Aealo” concept a lot. Another great record for Rotting Christ, with signs of inspirational decline becoming apparent. Not stopping the record from being loved by the fans, however. A ritualistic, multicultural and very different side of Rotting Christ. From Aramaic (“Ze Nigmar”), to French (“Les Litanies Des Satan” with Vorph of Samael joining in), to Greek (“Elthe Kyrie” with actress Danai Katsameni, “Tou Thanatou” a beautiful cover of a Nikos Xylouris song, “Άπαγε Σατανά”), English (“For A Voice Like Thunder” including Paradise Lost’s Nick Holmes narrating William Blake), Latin (“In Nomine Dei Nostri”, with Magus of Necromantia chanting at the beginning of the song) as well as a beautiful cover of Aphrodite’s Child’s “The Four Horsemen”. One of the most ambitious and experimental Rotting Christ albums, that was embraced by some for its multicultural nature and shunned by others (writer included) for its mediocre songwriting and sense of staleness throughout the music. Whatever the case might be, we can’t wait to see those rightful legends once more on stage, cause it’s 100% sure they’ll deliver the goods. NON SERVIAM! Rotting Christ @ Thessaloniki, Greece.